So maybe you’ve heard of this National Novel Writing Month thing, but you’re not really buying it. Maybe you’ve seen the lists of pros and cons, or read testimonies from some authors about why they don’t participate in NaNoWriMo. Well, I’ve read all those things, too, and I’ve found that most people who list out reasons they do not participate have never participated before, and so can’t really speak as to what they are missing out on. Usually these people, too, have a misunderstanding of what National Novel Writing Month is all about. It’s not about producing a finished, polished novel in 30 days (that would be ridiculous). Even if you write novels longer than 50k words, you’ll still get a good chunk of a novel squared away in 30 days, and that’s no small feat. So if you’re still on the fence about signing up for NaNoWriMo this year, let me give you the TOP 5 REASONS you should go ahead and do it, and this is coming from my three years of experience in participating, so I’m not making this up. 1)	Accountability is Gained, and Promises Kept. You can’t just say “I’ll write 1000 words today” and then not do it without any consequences. Consequences are how we learn, and without them, you’ll just keep doing the same thing over and over again with no end in sight. Get out of your rut. Stop breaking promises to yourself. If you keep saying you’re going to write, but then don’t, NaNoWriMo can be the thing that finally moves you forward and makes you follow through. Other people can see your word count. They can see that you didn’t write when you said you would. They can see you fall behind. Does that make you nervous? GOOD. That will be your motivation, your purpose. That means if you sign up for NaNoWriMo, you’ll no longer be able to hide in your dark corner, and you might actually do some real writing! Before I jumped into NaNoWriMo (very reluctantly, mind you), I liked to hide behind excuses. I liked to say I’d write original stories and then not write them. NaNoWriMo broke that bad habit of mine, and I’m eternally grateful! 2)	Community is Found, and Often Maintained. Feel like you’re the only writer in your entire city? No more! Join your regional forums, see when the NaNo folks are having a write-in, and go mingle! I know you’re saying, “Wait … you mean there are other people as obsessed with writing as me … in my area … like, living close to me? !” Yes, that’s true! Don’t be intimidated by strangers. The fact is, you already know you have one major thing in common, and anyway, you’ll mostly be writing, so there won’t be any pressure to be a social butterfly. Go be with like-minded people united in a common cause, and feel at home. Feel included. Feel normal. Make new friends. Get encouragement. (And cool NaNo swag!) Plus, you know, there’s the hundreds of thousands of other people around the world doing this, too, whom you can chat with online on the forums, or through other social media using the #NaNoWriMo hashtag. You are not alone. You are so not alone, and you never have to feel that way again, not even after NaNo is over! 3)	Priorities are Practiced, and New Habits Formed. NaNoWriMo gives you the opportunity to make writing a priority for one month. One glorious month in which we can tell everyone else to shove off, because we’re trying to write an entire novel this month! NaNoWriMo makes writing an event. An event is easy to explain to friends and loved ones as a reason to stay home instead of go do whatever nonsense they want us to do. We get one entire month to put this one thing of ours above making dinner and doing laundry and showering and watching movies, and we can make that time really count. And once you make your writing a priority for 30 days in a row … guess what? It becomes a habit. It becomes really hard to stop doing that. Beginning in December, you have formed a whole new attitude toward your writing. It is important. It is worth carving out a little bit of time for just you and your novel each day. It’s a new habit that dies hard, and your writing endeavors will be all the better for it! 4)	Time Management Skills are Acquired, and Hard-Wired. Carving out that bit of time for you and your novel isn’t always easy. And at any other time of the year, you might be inclined to give up your writing time for the day if it becomes inconvenient to your schedule. But since NaNoWriMo makes your valuable writing time an event, and because you’ve realized you’re not the only one doing this now, and because you have hundreds of thousands of other people watching your word count to know when you don’t write, you end up making it work, somehow, anyway. You find time you didn’t even know existed. You become a time-wrangling ninja, near Time Lady (or Lord)-ish in your ability to wrestle that wibbly-wobbly timey-wimey under control and bend it to your will. You write on days you never could have managed to write on before. And after 30 days of practicing this magical time-warp ability … it also becomes a habit. You become used to this manner of time management and writerly juggling. It’s a skill you get to keep forever, even when November’s over. And no one will ever tell you that’s a bad thing. 5)	New Writing Methods are Explored, and Enjoyed. Maybe you are a rigid plotter. Or a free-flying pantser. Or somewhat of an in-betweener. Attempting to write 50k words in 30 days is a real challenge. And each type of writer initially has to do some scrambling to figure out how their favorite method of writing fits into the harried schedule of NaNoWriMo. Plotters might feel confident they have their entire novel planned before November 1st, and while planning most certainly helps a great deal in most cases, heavy plotters can also find themselves crippled by their inner editor in the midst of NaNo. Pantsers, on the other hand, might feel secure in the knowledge that winging it brings forth a massive slew of words in short order, and that is almost always the case. However, come NaNo, pantsers might find themselves stuck mid-November because they have no idea where their novel is going, and they end up with 50k words … but 35k of those words are entirely useless to the overall story. NaNoWriMo offers an opportunity to explore methods of writing you might otherwise never have dreamed of trying, and methods you might find out end up working out extraordinarily well for you. NaNo forces you to think – and write – outside your box, which leads to new and exciting discoveries about yourself and your abilities. 6)	BONUS: CONFIDENCE. When December 1st comes along, and you’ve written 50k words in 30 days, no matter how rough or insensible (that’s what editing is for! ), you will never be the same as a writer. The knowledge that you can, if pressed, write that many words in such a short amount of time is a revelation. I’ll never forget the feeling I had after my first NaNoWriMo. Although my books are 150k words long, not 50k, a third of a novel in a month is more than I’d ever written in that amount of time in my life. It opened my mind to an entire new level of possibilities for my writing career. It meant I could have an epic novel rough draft complete in three months if I really wanted to, and that was an amazing thing. So don’t wait. 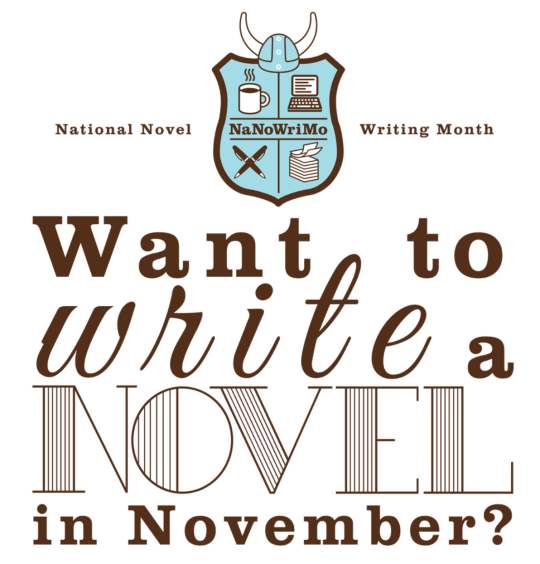 Sign up today at www.nanowrimo.org. Change your writing life forever. You won’t regret it!